This week is the beginning of the culmination of some busy weeks, but I’m feeling good about how things are going. Not least of all because it turns out I have a lens to test a random Nikon N70 with. More about that one in a week or so. For now, I’ve got a strange little vintage clone of a Diana in my bag, an interview on EMULSIVE, and will be selling a few prints soon. The Banier appears to be a cheap knock-off of the original Diana. There are a lot of examples of the Banier on the Internet, but I can find very little solid information about this particular Diana clone. 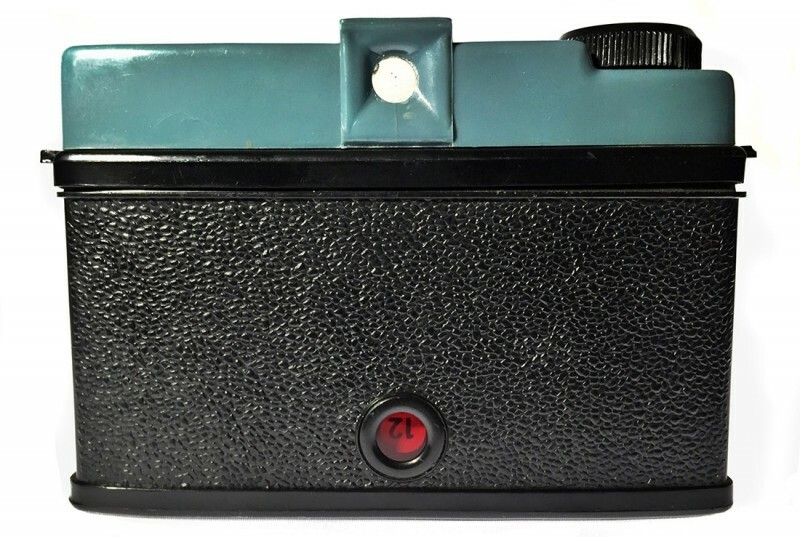 According to Camera-Wiki.org, “Diana” was just one of many names for the same cheap, plastic cameras made by the Great Wall Plastic Co. in Hong Kong in the 1960s and early 1970s. I’ve actually had this one on my shelves quite a while, too. At least four years, I’m sure. I remember buying it at the Brass Armadillo, and I’m not even sure Kate and I were dating yet at the time. I didn’t even know it was a Diana clone when I bought it. The Banier came with its original box, but it was missing some flaps and quickly crumbling. I may have it in my box of camera boxes, but I also might have let it go to the great camera store in the sky with some of its last remaining dignity intact. The thing about the Banier is, it’s a cheap piece of crap. I know I said that about the Holga last month, but I’m not even through my first roll of film yet and this is worse. So much worse. Based on the position of the ruby window, I can tell it’s a 6×4.5 centimeter camera. Or, at least, it’s numbered as one. The window is at the extreme bottom of the back and the frame numbers are upside down, meaning they are the “top” set. 120 film has different rows of frame numbers across the height of the backing paper for different formats, so you can tell the frame size by the position of the ruby window. The Banier is showing the numbers printed on the top of the backing paper, which are the marks for 6×4.5 frames. Numbers in the center are for 6×6 frames, and along the bottom are for 6×9. I suspect this once had a chrome ring on the front edge of the lens, as many Dianas appear to have had. The plastic is poorly finished and has what appear to be glue remnants in a few spots. It retains the shiny name plate around the lens, with the big Banier name and the distance marks. It’s a sort of scale focus that’s really zone focus, marked with three positions: 4-6 feet, 6-12 feet, and 12 feet to infinity. The thread on the lens is so coarse it only moves about one fourth of a turn, yet the front element is projected out nearly ¼-inch in that tiny bit of rotation. The plastic is what makes it feel cheap most of all. It’s a thin, brittle plastic. One of the strap slots that are molded into the sides of the camera has broken on mine. The whole thing is almost weightless, too — it feels like a roll of film about doubles its heft. 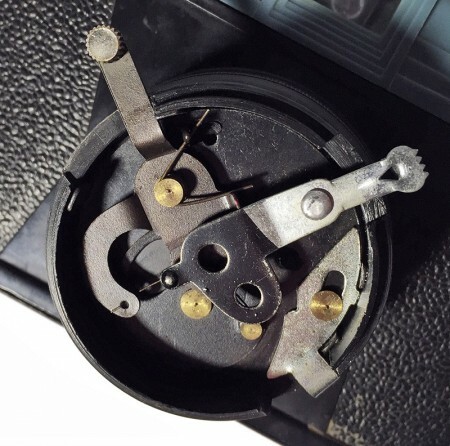 The Banier’s lens setup is slightly different from the more common Diana examples on the Internet, with the “aperture” adjustment on the opposite side of the lens barrel from the shutter release instead of them being next to each other. 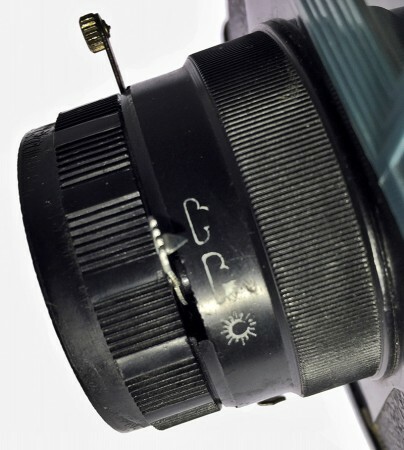 There’s a Bulb/Instant switch on the bottom of the lens barrel, too. I put “aperture” in quotation marks because, really, it’s just a little metal mask, painted black, with two holes in it. One is probably about f/11 and the other about f/8. These correspond to the barrel marks for “sunny” and “a little cloudy,” respectively. For wide open (or “a lot cloudy” in Banier lens iconography) the whole mask simply moves out of the way of the tiny shutter opening. Because the whole “aperture” assembly just free floats — you can see it only masks about the center third of the diameter of the lens — I am dubious about how effective it is. Beside which, it doesn’t stay where you put it. I’m not sure if my camera is missing a piece, but the “aperture” lever just flops wherever, requiring me to try to hold it in whatever position I select, with, so far, very limited success. I can’t believe I’ve managed to say so much about this thing and be so negative. 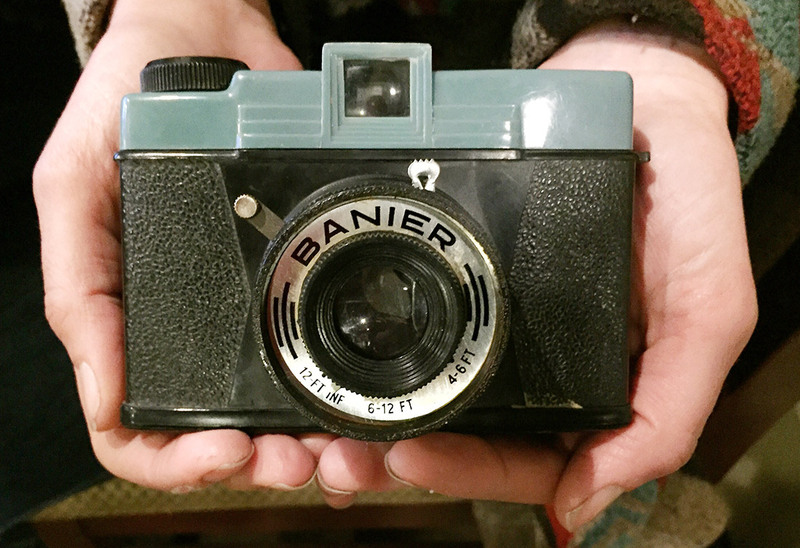 I’m not hating on the Banier — there is totally a place for toy cameras and cheap junk in the modern film photography world! I haven’t seen any images from it yet, but I’m expecting them to be on a par with the fuzzy frames from the Mar-Crest toy camera I discussed several years ago. If even that good. So yeah, my first impression is this: If you want a cheap, easy, lightweight medium format camera that takes terrible pictures, this may be the one for you. I have copious notes and will make a fuller report when I get some film through it. The response has been, to me, incredible. So many compliments I don’t really know what to say, except THANK YOU. To the entire EMULSIVE/#believeinfilm community, especially all those who tweeted at me today, and to @emulsivefilm himself, thanks. I’m completely gobsmacked, truly. Oh, and don’t forget to join the film photography EMULSIVE 2015 Secret Santa — registration is still open until Nov. 30, so you’ve got ten days to get in the mix. I’ll be participating individually, and Schneidan.com will be participating, too — you’ve got two chances to get matched with me and get some pretty sweet junk from my massive heap! Okay, look, they aren’t from my own darkroom. Despite some progress getting that set up, I still have some hurdles to clear before I can try my hand at printing. It’s probably worth considering that I’m going to be making garbage for a while until I get some experience, too. So for now I’ve had some digital C prints made by my friends at Englewood Camera on some of their Noritsu equipment. It’s not quite the same, I know, but these prints are made on Fujifilm Crystal Archive II paper and processed with RA-4 chemistry, and I’m having them matted by a trusted local framer with archival, acid-free materials. Like I said, I know it’s not the same — but I had an opportunity to respond to and not a lot of time. I’ll be offering for sale some 8×10 and some 5×7 prints (matted to fit standard 11×14 and 8×10 frames, respectively), as well as one framed 8×10 print. A couple of the images have never been published anywhere else before, if that tempts you. That’s right, I’ll be selling a few prints in person in Denver. If you’ve got any time on Thursday, Dec. 3, 2015, find me in the lobby of The Denver Post building at 101 W. Colfax Ave., across from the Civic Center, between 9 a.m. and 5 p.m.
What prints I don’t sell that day will be available for direct sale through my website afterwards. The selection is quite limited for now, but depending on response I may expand the available line, and I will transition from lab prints to handmade silver gelatin prints as I am able. If you’re in the market for gifts for the holidays, these might fit the bill. I also will be presiding over some of Kate’s handmade knitted goods. I can assure you that her material choices are of the absolute highest quality and her stuff is made to last. I’ll have complete details of the yarns and accoutrements at the show in two weeks. Not only that, but a great many other Post staffers, as well as family and friends, will be showing and selling their own handmade crafts and art, so there should be a veritable cornucopia of quality gifts on hand.